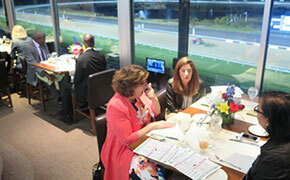 One of the more unusual outings visitors in Barbados can do is head to the local race track. Mingling with the locals, cheering on the local jockeys and maybe even coming home a dollar or two richer are all part of the fun. So where better to mark Barbados 2017 Year of Sport than at Toronto’s Woodbine Racetrack? 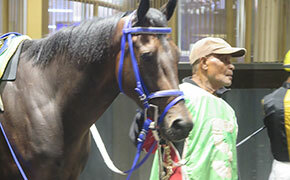 Even better, with popular Bajan (nickname for Barbadian) jockey Patrick Husbands! 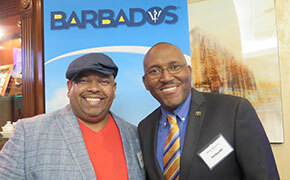 During the course of the evening, Peter Mayers, Director, Canada for Barbados Tourism Marketing Inc. gave us a great update on the island, and some meaty insider tips as to how to sell it best. First: Mayers was careful to point out that there can be a little confusion between “Barbados” and “Barbuda” – but Barbados was not affected in any way by the two hurricanes which recently devastated other parts of the Caribbean. And while there are still touches of the island’s British heritage (drive on the left, schoolkids in uniforms, tons of cricket plus afternoon tea – always popular with the island’s many British visitors), Barbados has its own distinct culture. The islanders are certainly doing something right: there was a jump of 12 per cent (to almost 60,000 passengers) from Canada so far this year. Lift is looking healthy with AC rouge having daily service from YYZ (twice daily Saturdays and Sundays in high season); plus four flights weekly with WS. From Montreal there is service on AC four times weekly. The Sporty Island: what do your clients like to do – or join as spectators? From cricket and polo to paddle-boarding, scuba diving, sailing, rugby and even running marathons: there’s something for them under the sunny Bajan sky. And no fear, they’ll always find someone to explain cricket to them! The Festival Island: there’s always something going on, with opera, motor racing, wellness, food and rum, reggae, history and gospel music just a few. The Authentic Island: As well as the “big guys” (Hilton, Sandals and Fairmont), clients can choose independent properties from the poshest such as the legendary Sandy Lane to funky B’n’Bs.